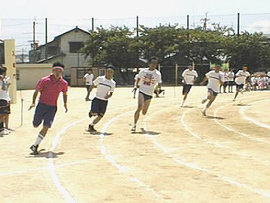 Students race againgst one another to be the fastest student in the school. Photo Courtesy of Shimamoto Daiichi Junior High School. School athletic festivals are one of a number of school activities, including the cultural festival and school trips, that are central to the Japanese school year. Athletic festivals usually take place in the fall, on a school day. They include track and field competition, a group dance, gymnastics, a tug-of-war, and a number of other events. Teams are made up of homeroom classes, so classes are really competing for bragging rights, telling everyone else in the school about their victories. Recently, many schools have included parents and members of the community in the activities. This is seen as a way to strengthen the bonds among school, family, and community. Some schools even ask the visitors to participate, and have events such as a tug-of-war competition between teachers and parents. The preparations for the athletic festival begin well in advance, with students practicing group dances and creating elaborate signs for their homeroom class. In many schools, classes are cancelled so students and teachers can spend more time preparing for the festival. The athletic festival is a time when students can have fun as an entire school.